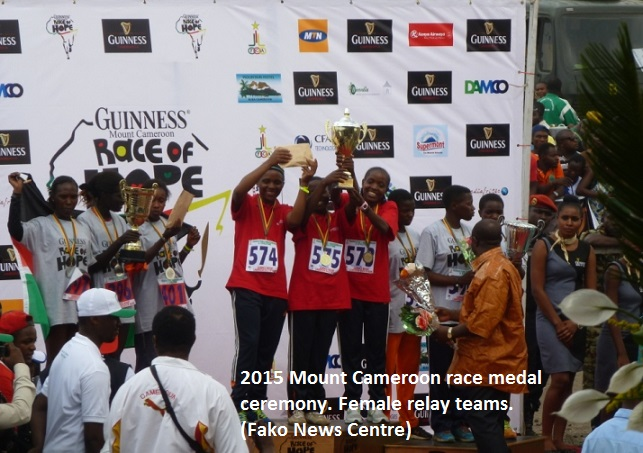 The 2015 edition of the Guinness Mount Cameroon Race of Hope has witnessed the bouncing back of former male and female senior category champions in the persons of Gabsibiun Godlove and Ngwaya Yvonne respectively. Godlove, who won the race in 2012 and 2013, narrowly won this year’s edition with just 1 minute and a few seconds ahead of the second athlete, Mbatcha Eric Mangeh. Eric, who won last year’s edition, gave Godlove a rough time on the descent between Upper Farms and the finish line in the Molyko stadium. On the descent, Eric emerged from the forest at Upper Farms, 10 minutes after Godlove . But by the time they ran to finish the race at the Molyko Stadium, Mbatcha Eric had gained about 9 minutes and was just a minute and some seconds behind Godlove who finished the race in 4hrs 32 minutes 12secs looking very exhausted. Ngwaya Yyonne, five times winner of the female senior category before this year's race, re-bounced to finish first this year in 5 hours 32 mins 10 seconds, making her six times winner of the female category. Confidence Nkargabi came 2nd and Fanla Wirngo came 3rd. 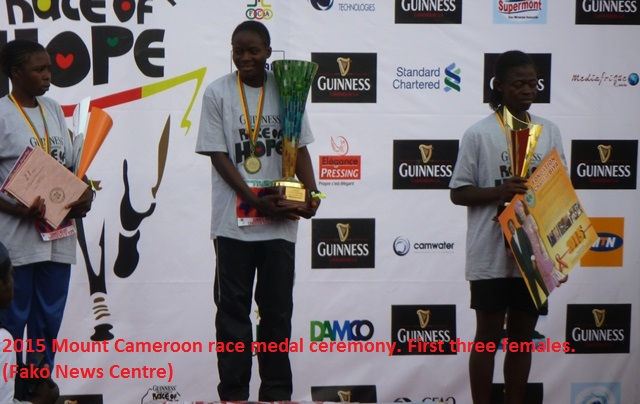 Last year’s champion, Ngalim Lisette(the younger sister of this year's champion), came 4th. 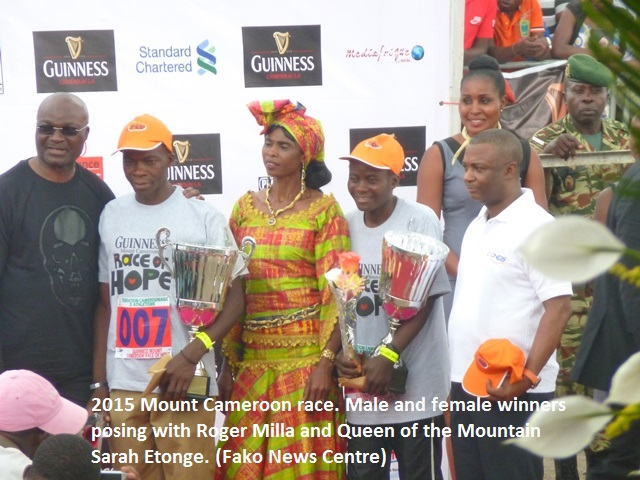 On a surprising note, the son of the crowned Queen of Mount Cameroon Race of Hope, Sarah Liengu Etonge, finished third. 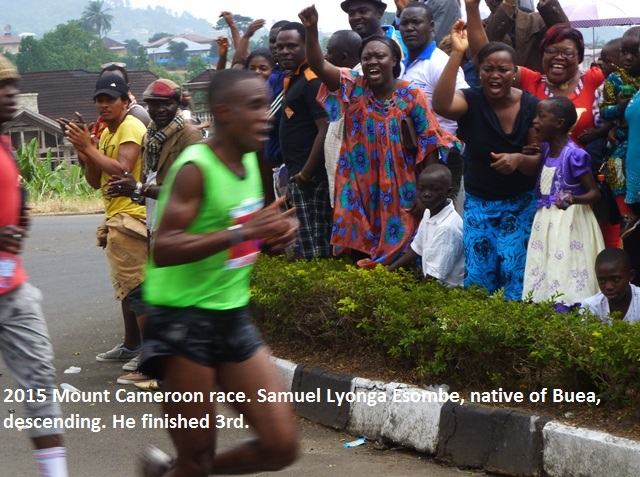 The son, Lyonga Esombe Samuel, rekindled the hopes of the indigenous people of Fako Division (Bakweri) who have spent over 17 years without any of their male athlete featuring among the first three. 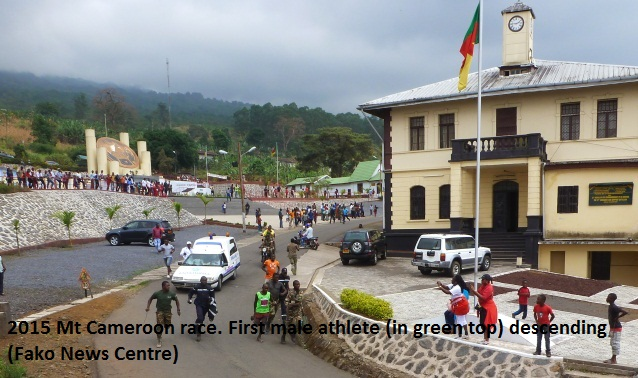 From live radio reports, Samuel Esombe Lyonga was reportedly being overtaken as third athlete on his way down the mountain. Many listeners stayed glued to the radio and also made phone calls to get updates relating to Mr. Esombe’s position from those who went to witness the race at different points along the mountain. 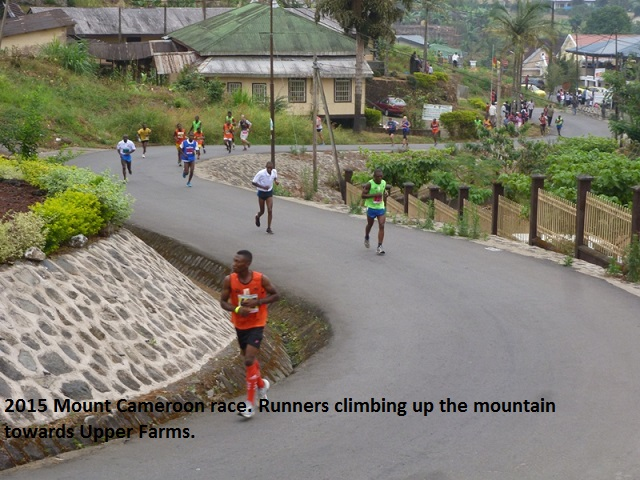 On arriving Upper farms, Mr. Esombe was met with a crowd of Buea inhabitants who motivated him by running alongside him. Some of them accompanied him to Molyko. It is this crowd that gave him the momentum to overtake the athlete who was in the 3rd position around the Mountain Club. 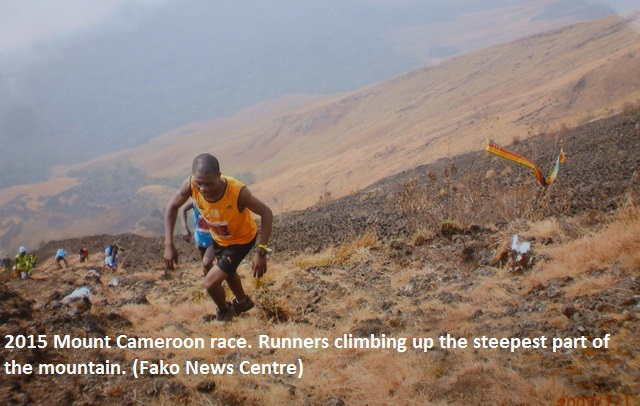 It was not actually clear if this athlete reached the summit, but the crowd encouraged him to overtake the athlete to avoid any unpleasant situation. He finally crossed the finish line after running for 4hrs 30minutes and 42secs. Both male and female senior category 1st positions went home with FCFA 10,000,000 each, while the second got FCFA 5,000,000 each and the third FCFA 2,000,000 each. The male and female top 1st positions got a two-way flight ticket each from Kenya Airways to participate in an international marathon in Kenya. Each of them also received a scholarship of FCFA 1,500,000 from the management of Saint Monica Health Institute for them or any member of their family to study nursing at the institution. 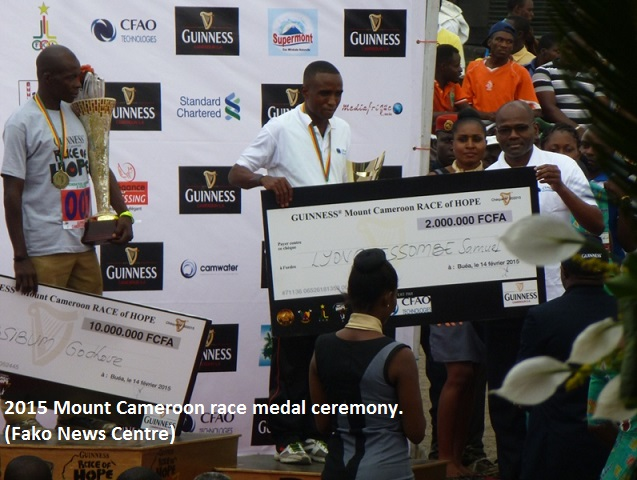 Gabsibuin Godlove and Ngwaya Yvonne also won a cash prize of FCFA 250,000 each for being the first athletes to reach the summit in their respective categories. 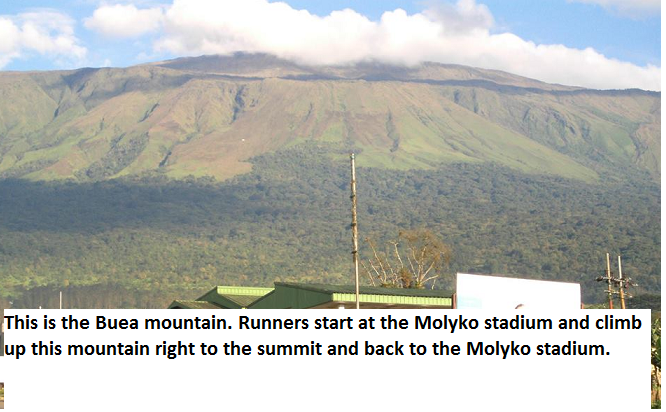 This edition of the race also witnessed the veteran category that ended at Upper Farms, the junior category that ended at Hut I, and the relay category that ended at the summit. A female relay team from Kenya came 3rd this year. 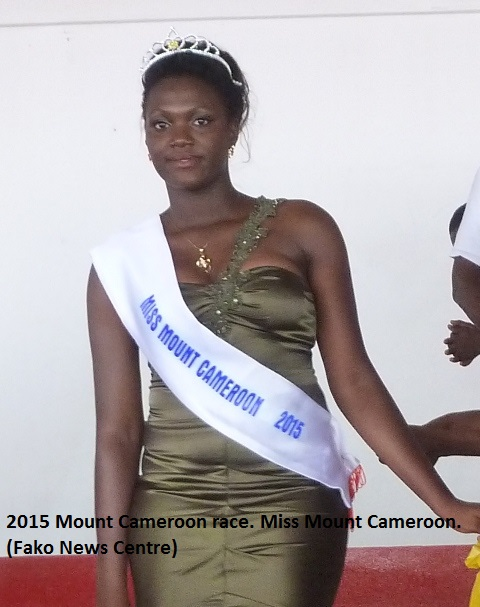 There was a beauty contest that produced a beauty queen. 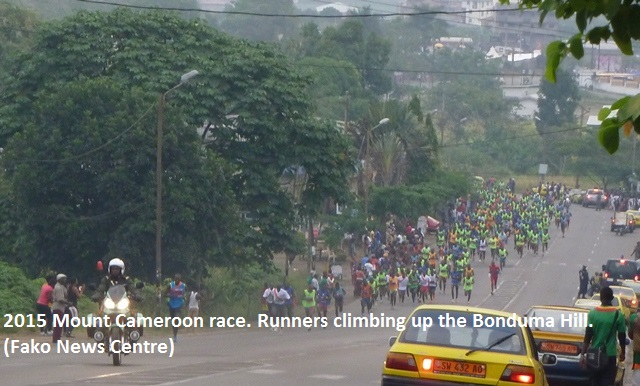 This race took place under tight combined security of the police, gendarmes and the armed force from the start point right up to the summit. The pictures below tell the whole story in chronological order.